1963 : les meilleurs films de l'année. Dr. John Markway: [voice-over] An evil old house, the kind some people call haunted, is like an undiscovered country waiting to be explored. Hill House had stood for 90 years and might stand for 90 more. Silence lay steadily against the wood and stone of Hill House, and whatever walked there... walked alone. 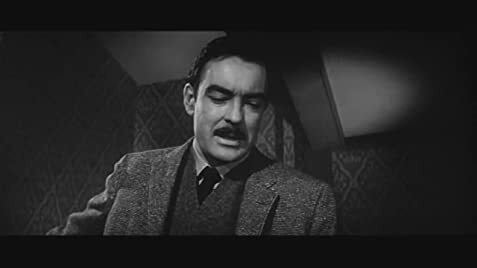 Alternate opening with voice-over by the Mrs Sannerson character in place of the Markway monologue.The titles prior to this scene are slightly different. The 'History of Hill house' scene continues into the meeting with Mrs Sannerson and Markway but in this version, it is Sannerson who is doing most of talking. The following scene from the general release print of Markway listing his subjects on a blackboard is missing. In it's place is a scene where Theo throws her lover out her appartment and, next to a photo of her lover, writes "I Hate You!" on a mirror in lipstick, looks at her reflection and mutters "I hate you too...". She then receives her invitation from Markway. This is delivered to her by her landlady how requires the excess postage to be paid. Theo already knows this is to be paid and there is humourous exchange concerning her ESP or her 'gift'. There are several extened scenes involving Eleanor's 'inner thoughts' - most of which tie into her thoughts on her possible relationship with Markway. The scene showing her travelling to Hill house is extended with more 'inner monlogue' material including a couple of shots of her turning onto 'route 238' and commenting on "Journey's end in lovers meeting...". The Morning/Harp scene runs longer and contains more dialogue from both Eleanor and Markway. This print had a title card prior to the MGM logo - "This print is on loan from the National Film and Television Archive"
Q: What is the history of Hill House? Q: Why has Dr Markway arranged this experiment at Hill House? Will keep you on the edge of your seat for 2 hours! 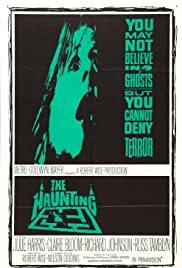 Seeing 'The Haunting' in the horror section, rated G, was the first surprise this movie offered. Even though the rating may seem tame, the film offers a lot more than many of the trashy 80's and 90's horror movies which always seem to make it into video stores and hang around like a bed smell. This small gem of a movie may not stand out on the shelf and probably wouldn't appeal to many horror fans scouring the shelves for the latest gore flick, but if their eyes were to look past these to 'The Haunting,' they would be in for a pleasant surprise. This film is what a supernatural story should be - forgoing the usual barrage of special effects and buckets of blood, and relying on excellent cinematography to achieve the scares. The black and white combined with unique camera angles give Hill House an eerie, almost mystical appearance. Even though some of the acting may be a little corny at times (amid some superb acting, it must be said), the film manages to build tension steadily without ever showing the 'ghost,' therefore leaving you on the edge of your seat throughout. The main character (Elenor Lance) does unfortunately grate on the nerves after a while, being an overly neurotic and paranoid character, but otherwise the cast acts creditably well...even though the house steals the show! If you want a movie that gets your heart racing, turn down the lights and pump up the sound. Hill House will have you on the edge of your seat and keep you there for almost 2 hours. I only hope the remake this year does this superb film justice. 41 of 67 people found this review helpful. Was this review helpful to you?